BERLIN â€” Justin Timberlake says he thinks vinyl records sound better than digitalized tunes. This is being sold as new, only out of the box once to photo & test. 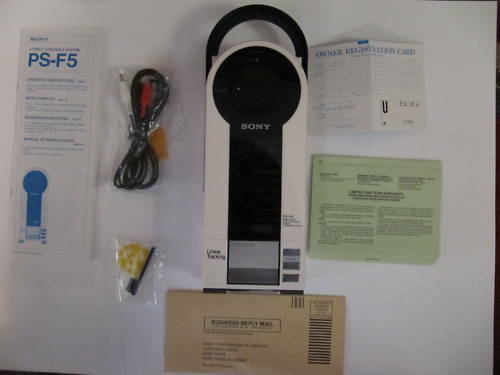 What doesn’t quite add up to me is why the seller would have removed the It’s A Sony sticker from the front of the player and stuck it on the cardboard box. Weird. Anyway, I guess you could try to stick it back on, but I doubt it would go back all that cleanly. So if money’s no object and you want an almost Fresh-Out-the-Box clean example, throw in a bid now. It only received one bid, but sold for US $1,200.00! 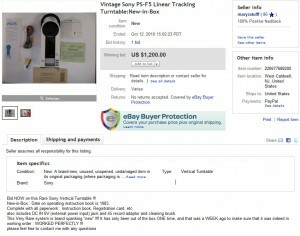 You are currently browsing the Sony PS-F5, PS-F9 & Flamingo Portable Linear Tracking Turntables blog archives for October, 2010.